Bill Crawford, Patriarch of this family business. Bill Crawford has been taking his family into the outdoors and backcountry locations for a lifetime. While his two boys were still young, he began intently seeking quality time with his sons and family in general. Fishing and hunting adventures were the cement that bonded his family so that it became a regular and frequent priority to seek outdoor fishing and hunting adventures. Visiting the fish camp on the Akwe River repeatedly for a number of years, the Crawford family purchased the outfitting business from “Hippy John” Matsko who had operated as outfitter and guide on the Akwe River camp site for over 20 years. Read more about “Hipppy John” below. Bob Crawford is Bill Crawfords’ son and Wilson Crawfords’ dad. 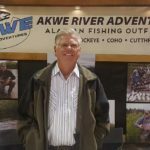 Bob has spent his career tending the main family business and enjoying outdoor adventures with his own sons, including many repeat trips to upgrade and promote the new family business, Akwe River Adventures. John Crawford is Bill Crawford’s eldest son who has been involved in his own business ventures as well as outfitting and guiding with business partner Joe Wood in Idaho based Selway Ridge Runners. John splits his time between his home town of Mount Vernon, WA and the Selway Bitterroot Wilderness where he takes guests for hunting Elk, Whitetail Deer, Bear, Cougar, and Wolf. He contributes time during the summer months of June and July outfitting for Akwe River Adventures. Joe Wood is an entrepreneur in his own right, owning a business in Grangeville Idaho and outfitting with partner John Crawford on a joint venture to provide wilderness hunting experiences as Selway Ridge Runner Outfitters. Offered are guided hunts for Idaho Elk Hunting, Whitetail Hunting, Cougar Hunts, Spring Bear Hunts and Wolf hunts. 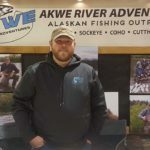 June to July, Joe is a member of the Akwe River Adventures team of guides to provide fishing adventures in a remote Southeast Alaska location on the Akwe River. Joe and his wife, Kim, have 2 young boys and as a family, they continue the honored legacy of family time in the great outdoors, building character in their children by spending time with them, teaching and passing on family values. 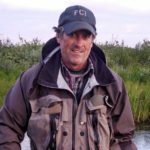 Idaho’s Public Lands and Wilderness Areas exemplify the virtues of strength and vision that match outfitters like Joe Wood, a hard working family man who loves to hunt and fish and loves being out in the wilderness. Wilson Crawford is attending college in Spokane and is training to become a bush pilot where he will contribute his flying skills to the family business on the Akwe River. He’ll also participate as a fishing guide on the Akwe River. Wilson is studying business in lieu of the Akwe River Adventures business, a treasured family legacy that he will rise to fill a central figure in operating AkweRiverAdventures in the distant future. For now Wilson, a young man of exceptional potential, is keeping focused on his studies. “Hippy John” Matsko is a veteran of 15 years, outfitting and guiding on the Akwe River in the Tongrass National Forest. “Hippy John” was the original outfitter permitted by the National Forest Service, Yakutat Ranger District to operate on the Akwe River in the Tongass National Forest. 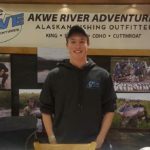 He will retain his presence and role as part-time guide with the Crawfords “Akwe River Adventures”. Akwe River Adventures permitted by the National Forest Service, Yakutat Ranger District to operate on the Akwe River in the Tongass National Forest. 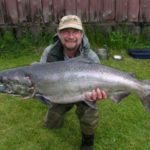 King Salmon and Silvers (Coho) are the primary runs.